You’re probably wondering why there was no blog post yesterday. There’s a logical explanation. We were attacked by dinosaurs! Oh Dog! It’s trying to get my nose! So…. any other dinosaurs wanna mess with me? But seriously…. 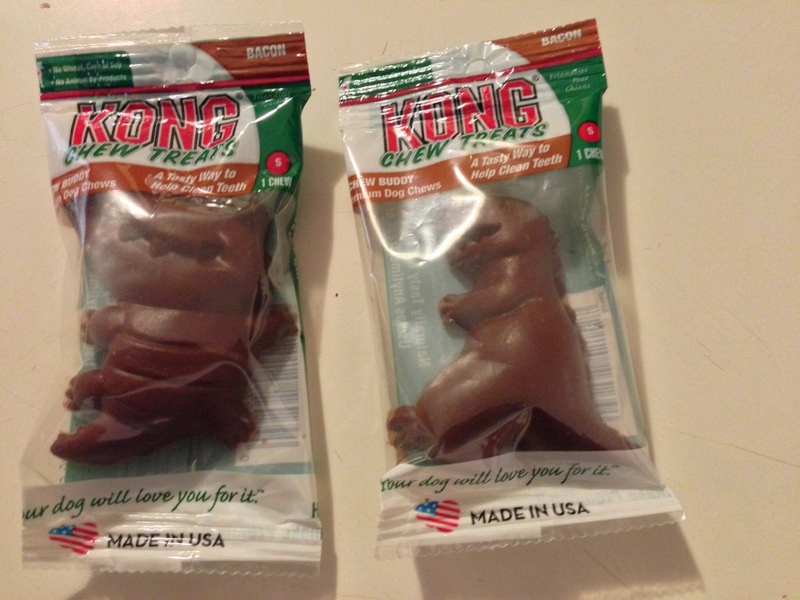 I can’t believe Kong hasn’t asked me to be their spokesdog for their dinosaurs! RAWRRRRR!!!!! I don’t think those dinosaurs are going to be stealing your cookies! I know! I bet they never even heard of the Cookiesaurus!!! It was a close call Basil! It could be worse…imagine if those were sneaky squirrels disguised as dog treats sneaking in! Oh Dog! There were some of those at the store! ACK!!!!! I don’t think they had any skunks…. but they did have squirrels! ACK!!!! You guys, show them who’s boss!!!! That sounded scary! Good to know if a dino ever attacked me I could call on you and DeDe to chomp them away. OMD OMD it is good that you were able to SAVE your HOME and Hearth from the terrible attack!!! And I’d do it again if only Jen would buy more! That was a very close shave! Good thing they tasted like bacon!!! Phew! *wiping sweat with a paw* I’m glad you defeat those dinosaurs!!! Hmmm….the dinosaurs look cute, don’t they? Lola wants me to go out and get her some of those today! She wants to mount an offensive. Good thinking Lola!!! This explains a lot. I’m glad you survived the dinosaur invasion. Can it get any better fur you Rumpy? 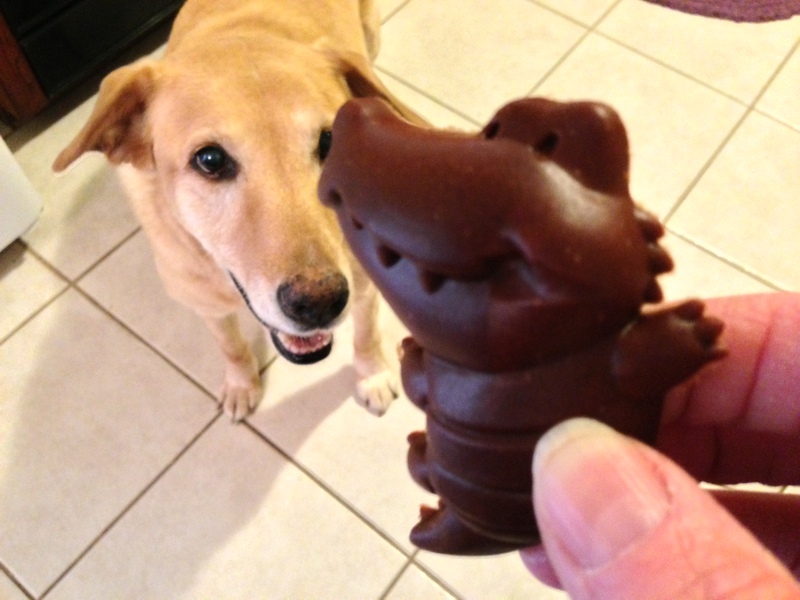 Treats and dinosaurs all in one…how kewl! I’m on the way to rescue you :o) They look yummy!!! They did! They asked me today to host a giveaway! Stay tuned! Glad you two were alert and launched a counter attack. They need to be put in their place. One of the little known facts about dogs is that they are excellent at fending off dinosaurs! We will be on great demand when they start making them on the laboratory! Isn’t it funny what dog food companies come up with to impress people? 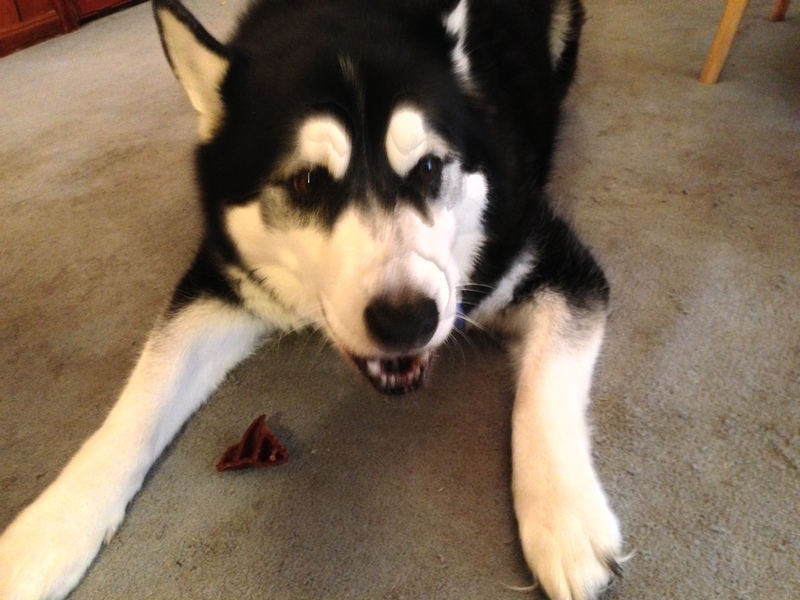 I can’t imagine Rumpy or DeDe cared if the treat was shaped like a dinosaur, bunny, or rock. Maybe not, but the post got the company’s attention! 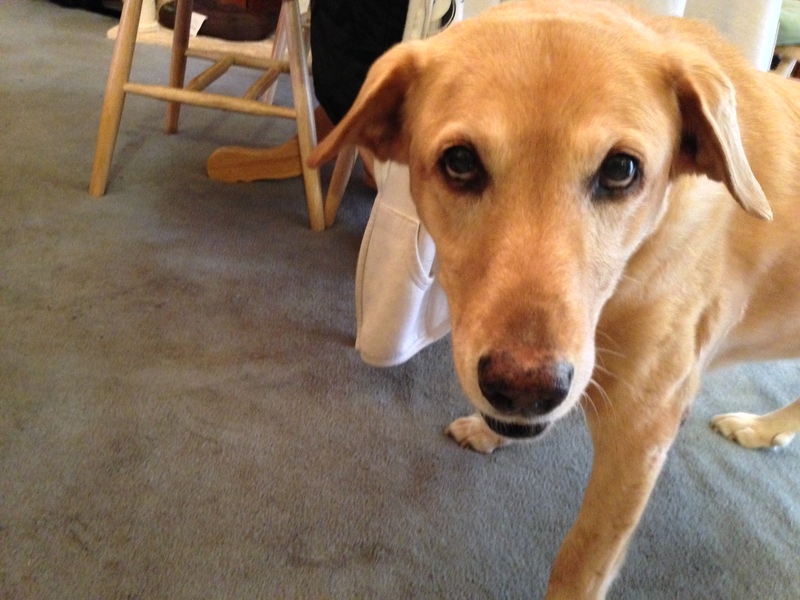 OMG Rumpy you are a saviour a SuperWoof with super truper powers…Thank god we have you..they were such nasty Dianosaurs, am so glad you knew what to do..
Haha, awesome! That is NOT the kind of dinosaur I want to be! They are pawsome – I’m going to see if they have them in Australia!! Dinosaur toys??! Yikes. Fun! You should definitely be the spokesdog! ha ha – now I see why you asked me about dinosaurs! he he – we didn’t know it was a doggie toy. I didn’t know it was either, until yesterday! woo woo woo! Those dinosaurs didn’t stand a chance…. Those dinosaurs looked SO fierce! And delishus, too. We hope you enjoyed! I did! I never knew saving the world from destruction could be so delicious! 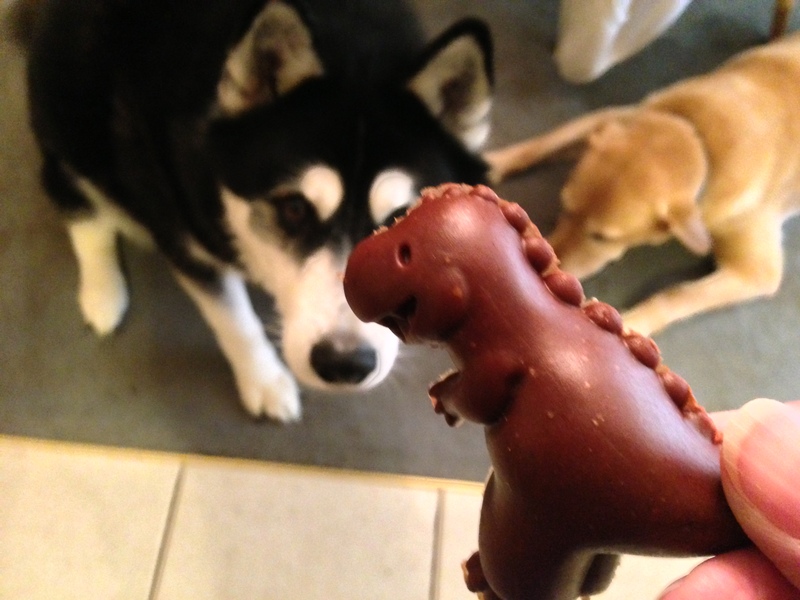 Jurassic treats! Awesome…loved the photo’s too…Dino was biting your nose HA! Cute. Hi DeDe (waving) I luv you! So awesome! I have been impatiently waiting for these to come out in stores! 🙂 don’t mess with The Rumps and DeDe. Grrrrrrrrrrrrreat show guys. My cats wouldn’t get it, ha, ha, ha!